Drawing Coach: Some tips to help get you drawing. "I have thoroughly enjoyed the course and although I still find it difficult to draw a circl I can now say 'I can draw'. I loved the intensity which really focused the mind... I cannot think of a single thing to change. Accommodation good and food brillant. Setting to die for." Collect some reference images - postcards or images of old master drawings, photographs of landscapes or people - and keep these to hand so you can go through them and find something to draw. Meeting up with like-minded people can be a great support. If you can't do this locally, there are all kinds of drawing groups on the internet, as well as a wealth of material in terms of tuition on sites like YouTube. Of course, quality is variable so do your own self regulation. There are some excellent warm-up exercises you can do anytime which will stand you in good stead such as blind contour drawing (keep your eye on the object and as your eye moves very slowly move the pencil accordingly. The only rule is don't look at the drawing and don't lift the pencil off the paper)and practising cross hatching. Sign, date and keep your work as a record of your progress. Seeing how you are improving will spur you on. 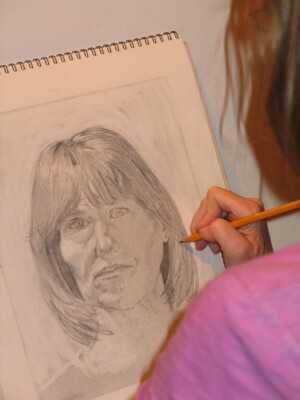 Stand back from your drawing as often as you can, walk away and come back and see it with fresh eyes. When you think you’ve ‘finished’, leave it propped up, go away and keep coming back to it, you’ll soon notice anything that looks ‘off’. Turn a drawing upside down – areas that aren’t quite working will jump out at you. If you have a digital camera or a camera on your phone taking a quick snap can serve the same purpose. For every critical comment you make on your finished drawing, match it with one positive thing you are pleased with. It could just be the fact that you didn’t give up or the way you’ve caught the light in one spot. Look at your own work as you would look at someone else’s and be as kind to yourself as you would be to them. DIOR ILLUSTRATED: RENE GRUAU AND THE LINE OF BEAUTY at Somerset House until 9th January 2011. PIONEERING PAINTERS - THE GLASGOW BOYS 1880-1900 at the Royal Academy until 23rd January 2011. The Royal Academy of Arts presents the first major exhibition in London for over 40 years to celebrate the achievement of the Glasgow Boys, the loosely knit group of young painters who created a stir at home and abroad in the final decades of the nineteenth century. THOMAS LAWRENCE: REGENCY POWER & BRILLIANCE at the National Portrait Gallery until 23rd January 2011. Thomas Lawrence was the greatest British portrait painter of his generation and one of the most celebrated artists in Europe in the early decades of the nineteenth century. This exhibition, the first in the UK for over thirty years, presents fifty-four works drawn from international public and private collections, some never before seen in public.